$9.95 US + shipping OUT NOW!!! 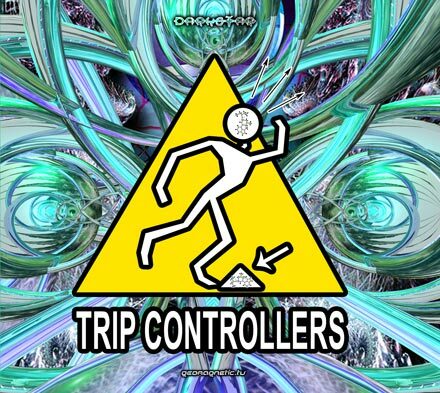 TRIP CONTROLLERS is a THEME compilation that takes you on a journey from begin to end. The start of your journey ushers you into a fun filled adventure where your mind is the territory to be explored. You will find along the way that we have control of your senses for the duration and we will help you to Bust down those walls inhibiting your Brain. Using hi tech tools to induce the Electrical Activity to your cerebral pleasure centers. If you start to feel over whelmed Dont Panic! Taken by the power of realisation knowledge demands action Right Now! Awareness comes through delving deep through knowledge already attained by Recycling your Dreams to recall these blocked memories. By using this enhanced state of mind you attain Synchronisation with your body and spirt. Confronting your demons can be a Bad Trip but it must be done. Now the path to Eternal Happiness can be found. Twists and turns can bring unexpected memories suppressed by Traumatik Amnesia. Now you realize that the your outdated mental programing from your past is what is holding you back and that you are your own Trip Controller. 12 Demented Psychoacoustic Scientists from across the globe conspired together to take you on this journey of the mind you will never forget! Enjoy 10 specially formulated trips for your mind.